About a year ago a new teeny-tiny restaurant opened about four blocks from my apartment, called Dimes. They serve classic, healthy american food, which is predominantly vegetarian, though they throw in some bacon or chicken here and there. There is a daily juice, a fantastic breakfast biscuit with avocado, bacon, and egg, and a fantastic black rice breakfast hash. Dimes is also a bit of an anomaly, although its west-coast, laid-back vibe and healthy kale-heavy dishes are about as uncommon as seeing as a rat on the subway tracks in this city, here in Chinatown, it is the only place of its kind. Now, I love Chinatown, I love the $1-for-five dumpling spots, the fresh watermelon slushes, the tiny, warm, sweet Hong Kong cakes cooking in the sidewalk food carts, the mouth searing spicy tingly noodles. I could write odes, sonnets, perhaps even epic poems about my love of eating here. But every once in a while I want to mix it up. S used to tell me (due to my overconsumption) Man cannot live on dumplings alone. And those mornings when I wake up craving a healthy American breakfast cooked by someone-who-isn't-me, S and I head to Dimes. 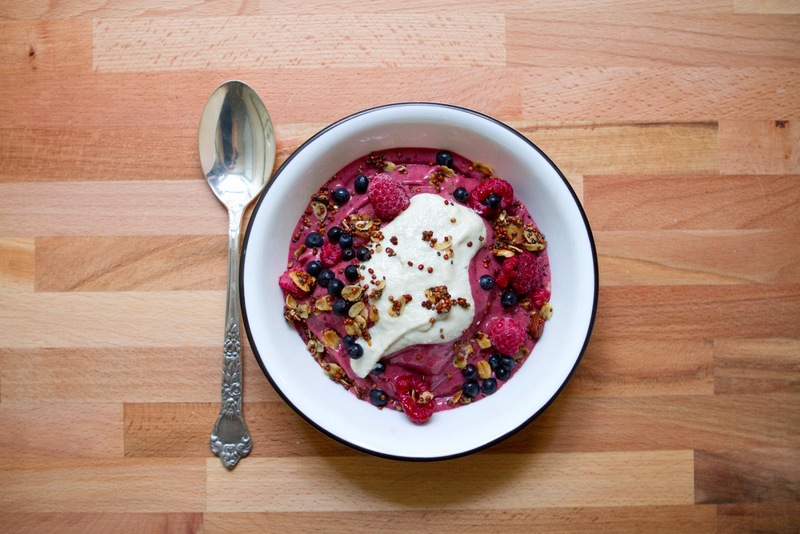 My favorite breakfast at Dimes, especially in the summer, is an Acai bowl. 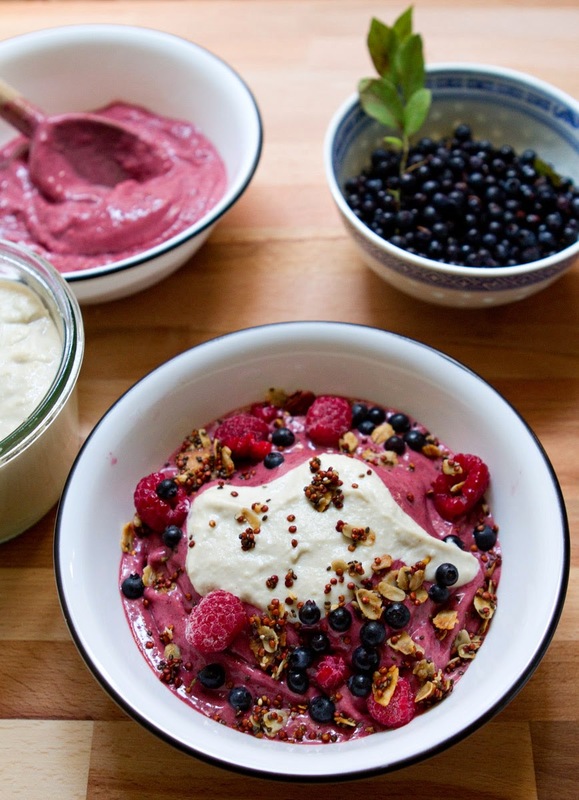 A thick, rich smoothie topped with crunchy, crispy, creamy, and fruity toppings that you eat with a spoon, Acai bowls are wonderful. They're incredibly filling but only contain healthy ingredients. There isn't one thing in this whole recipe that is bad for you, yet it's so delicious and rich I would call it downright indulgent. 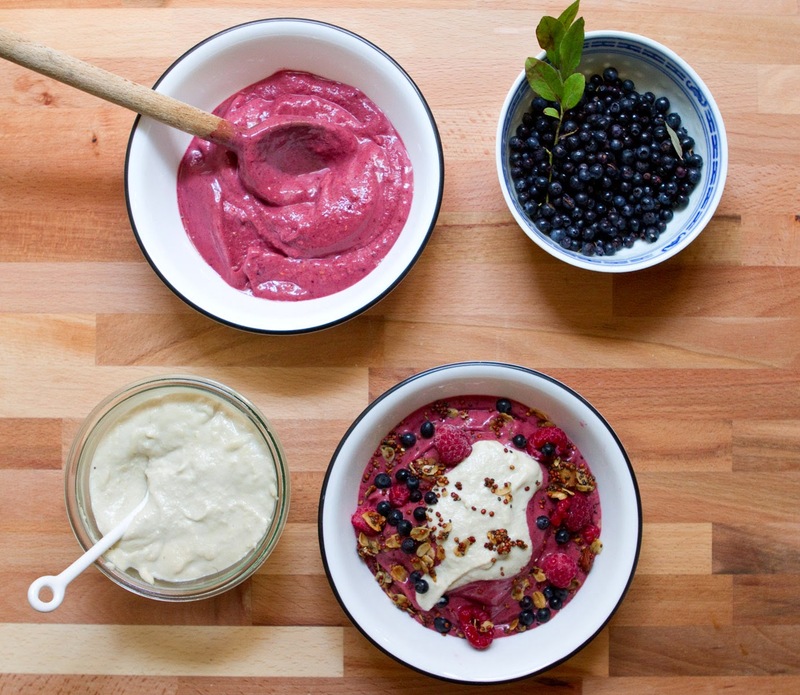 After noticing frozen packs of acai puree at Whole Foods I decided I would make my own acai bowl. 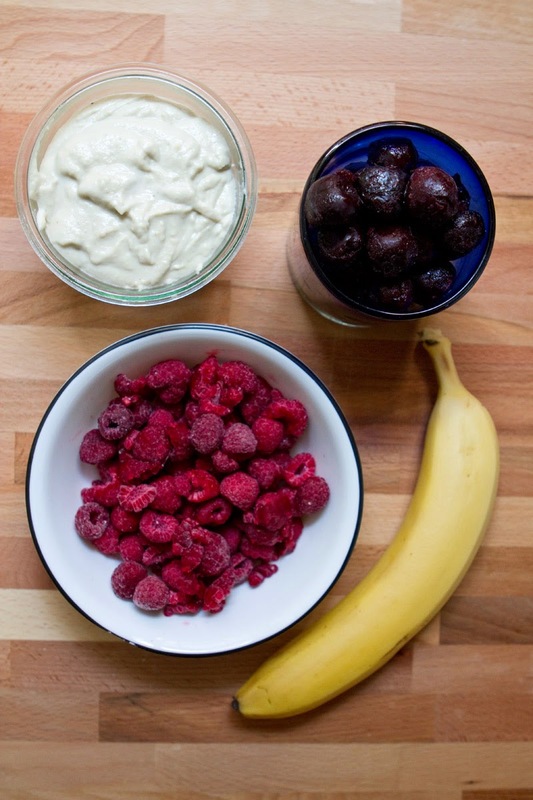 I decided to go simple and fill it with raspberries and cherries, which are easy to find pre-frozen, but are also seasonal right now, so you could easily freeze your own, and banana, which always makes a fantastic thickener and smoothie base. My mother always based our smoothies in banana when I was a kid, and I have a heard time imagining blending up fruit without at least one! Unless I'm making an avocado smoothie, avocado is also a great thickener and base, but has a totally different taste. The banana I bought fresh and froze myself by peeling and cutting it up and popping it in a ziplock then freezing it overnight. Never freeze a banana with the skin on. This piece of advice seems so obvious that I wouldn't bother bringing it up except that S has frozen bananas without removing their skin when I wasn't looking and it was disastrous. Mostly in that the skin was then unremovable and I'm pretty sure we had to throw the banana away. I topped my bowl with cashew cream, my new obsession. It's so creamy and sweet and thick. If you put it in the fridge it becomes so thick you could use it as frosting. At room temperature it's a bit like half-formed whip cream, or a slightly grainy creme fraiche in consistency. 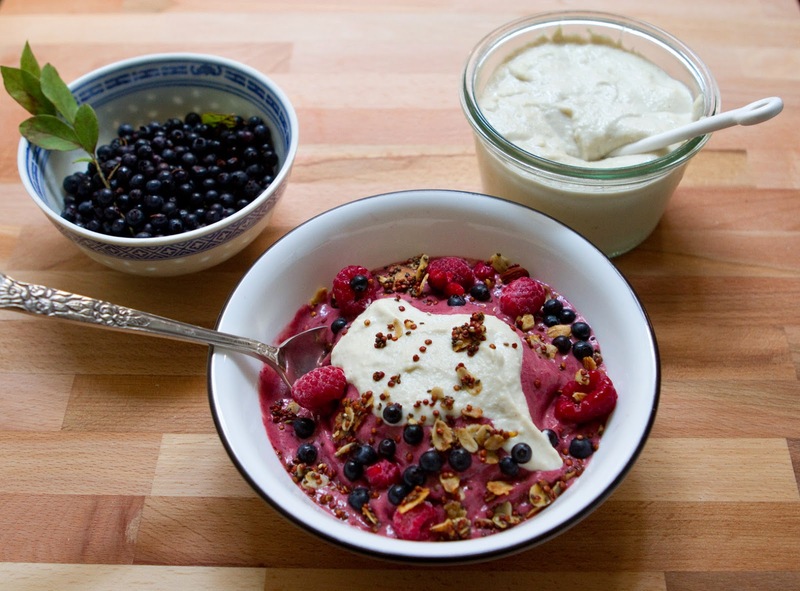 I also threw on some additional frozen raspberries, some of my honey chia granola, and some wild blueberries. The blueberries S and I picked while camping a few weekends ago in New Jersey. Did you know that New Jersey is absolutely full of blueberries? This is the second year in a row S and I have camped at the same campground packed with wild blueberry bushes. We go to this campground primarily to float down a small rooibos-tea-colored river that winds through the state park on inner tubes while drinking beers and stopping for swims at little rocky beaches. The blueberry bushes surround the campsites and cover the banks of the river, some are so large they lean out over the river, allowing a person on an inner tube to reach up, grab the branch to slow their float, then pick a handful of blueberries to munch on while they continue down the river. Basically, what I am saying, is that it is heaven. I am sure one could devise many additional toppings for this, however. 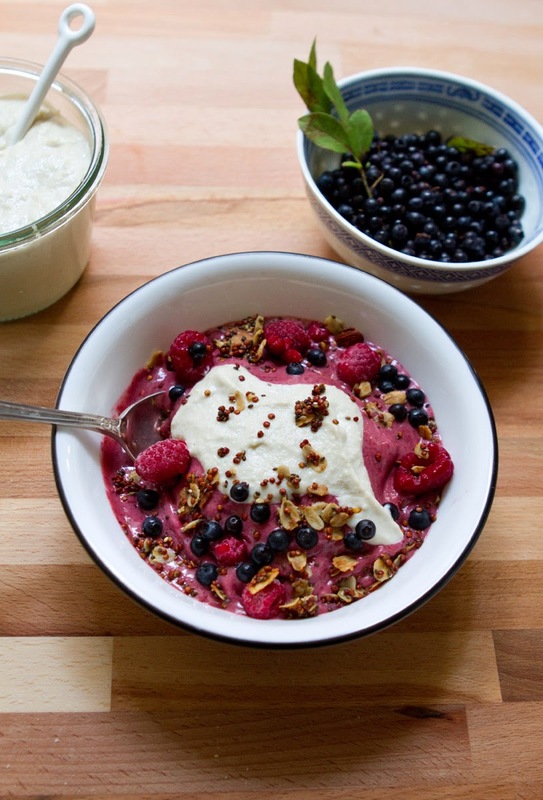 Blackberries would be lovely, and flax seeds, or some thin banana slices and a scattering of toasted hemp seeds. The Cashew cream adds this very decadent layer of creaminess that matches really well with crunchy toppings and tangy fruits. 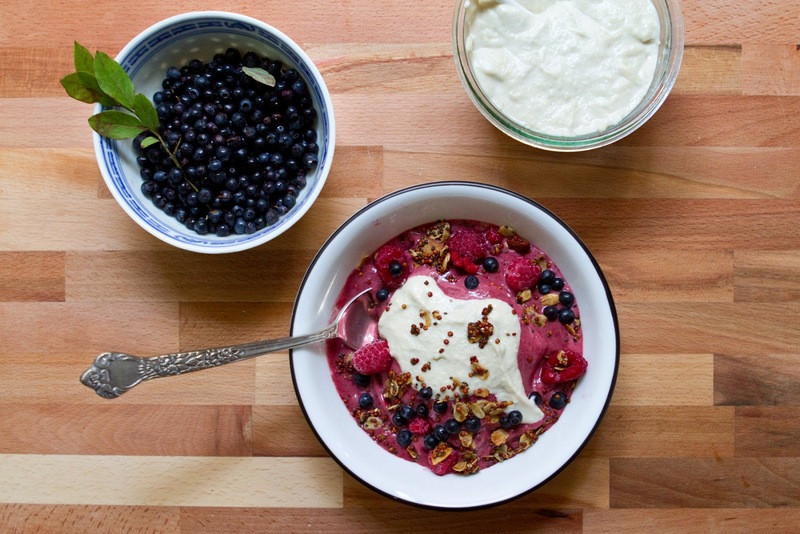 This is a wonderfully energizing breakfast, or a very healthy lunch option! 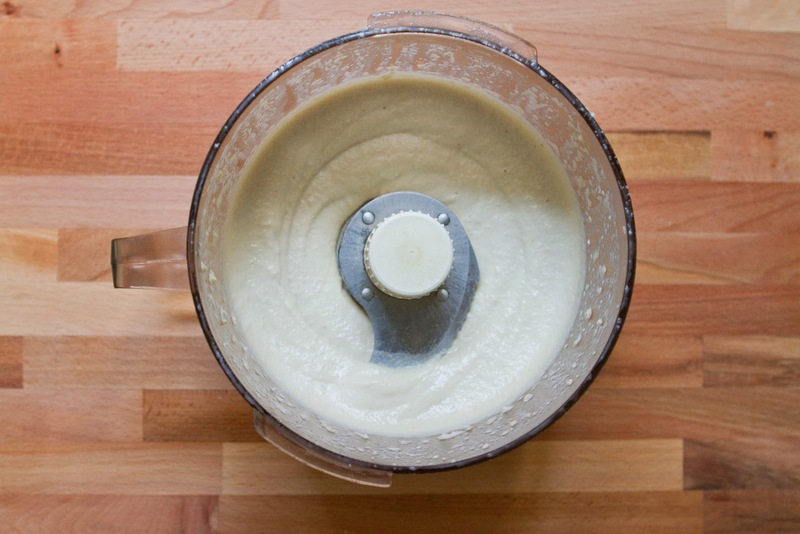 Begin by making the cashew cream. 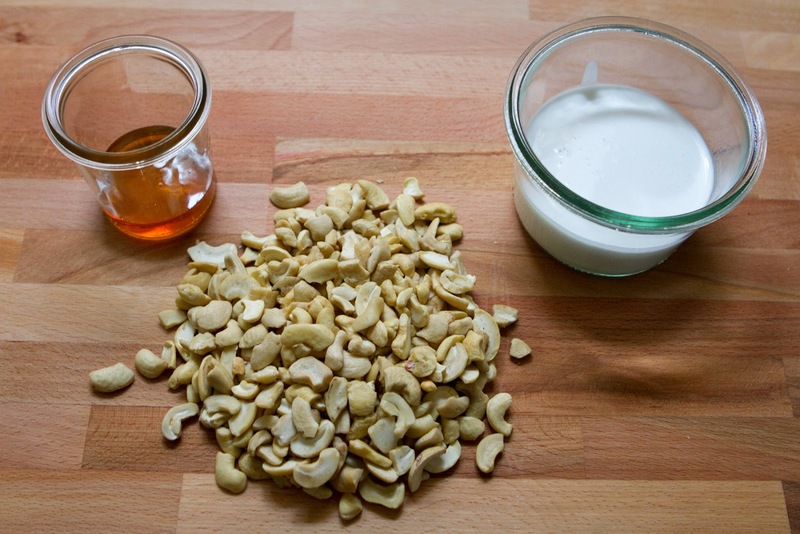 In a food processor (or highspeed blender) combine the cashews, 2/3 C coconut milk, and the honey. Process on high speed for 3-4 minutes, until very smooth. Set aside. 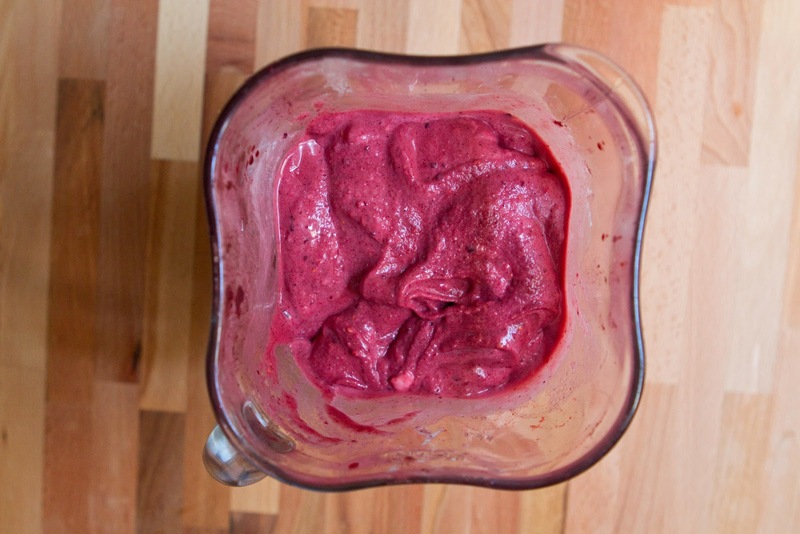 In your blender (separate of the cashew cream), combine all other ingredients and process on high until smooth. Use the highest setting on your blender so it runs the minimal amount of time and does not heat up the ingredients as much. 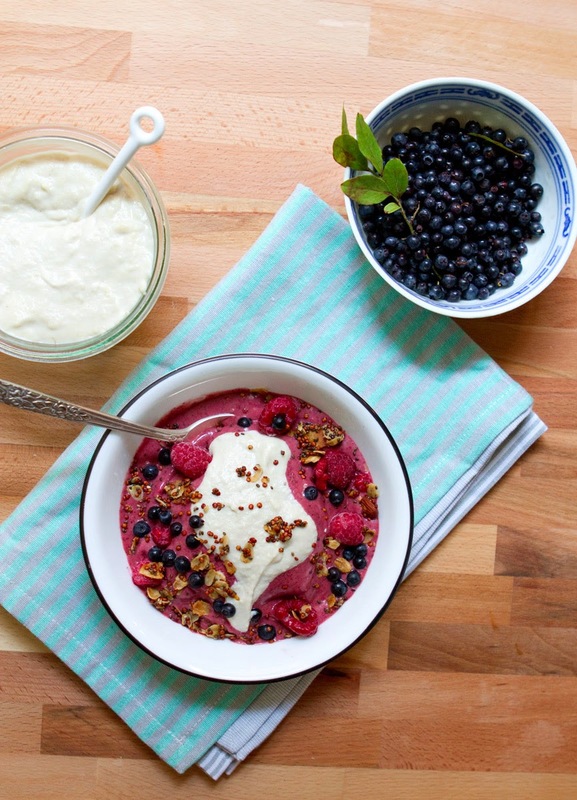 Scoop into two bowls, top with a dollop of cashew cream and a sprinkling of desired toppings. Serve immediately an enjoy!